Home >> The University of North - Chiang Mai. “Chiang Mai” is a province located in the north of Thailand with more than 700 years of its history. Chiang Mai is also the biggest center of education and business in northern Thailand. It is one of the most popular destinations of tourists who come to experience its beauty, diverse cultures and unique architectures as well as the beauty of its nature. “Java Cassia” refers to good faith and resolution of the founder towards his determination to build a high quality institution with desirable attitudes and to develop the skills and potentials of the youth to be future good citizenship. “Pink” refers to the fresh bright and it is the color of King Rama V birthday. “Yellow” refers to the brightness led to the ultimate goal of life. It is the color of King Rama IV of Thailand. Academic gown and academic brooches of North-Chiang Mai University are in accordance with the ministerial regulations No. 19 Year 2535 BE (1992 AD) as per the Ministerial orders of the Ministry of University Affairs. There are 4 types of academic gowns represent a Bachelor’s Degree, Master’s Degree, Doctorate degree and academic gown for member of North-Chiang Mai University Member of council. The basic material of the gown is an attractive white gauze-like cloth. Along the edges are bands of color (gold, black, etc.) of different colors and number of bands denote the level of higher education and faculty of the graduates. 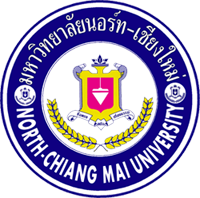 History North-Chiang Mai University Philosophy Vision and Mission The University of North - Chiang Mai. Board of Directors of NCU Council University administrators Administrative structure of the North - Chiang Mai.